More and more I encounter company’s who already own a distribution mechanism, or already have implemented the Microsoft Deployment Toolkit, and are looking for a distribution mechanism or deployment mechanism. 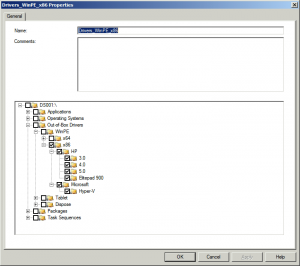 Since MDT is free to use, and RES Automation Manager costs a fraction of the cost then System Center Configuration Manager or nowadays the entire System Center Suite. 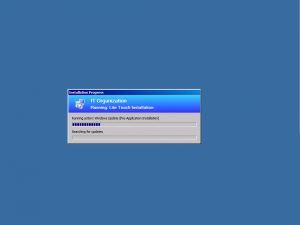 This makes allot of sense to allot of people, that integrating or combining MDT with RES Automation Manager is a strong combination to service workstations, servers or other hardware that needs to be provided with an operating system and software. Although I’m pro MDT, I’m not necessarily against RES Automation Manager. I only want to point out that the need for a management tool depends on requirements that are drafted by the people who determine the company policy on this topic. Now it may occur that you or your organization already has RES Automation Manager incorporated into your organization. All the modules, projects and run-books have been figured out, so taking them out of RES Automation Manager to put them in MDT might be a bit crazy, especially when those modules are also used in other situations. 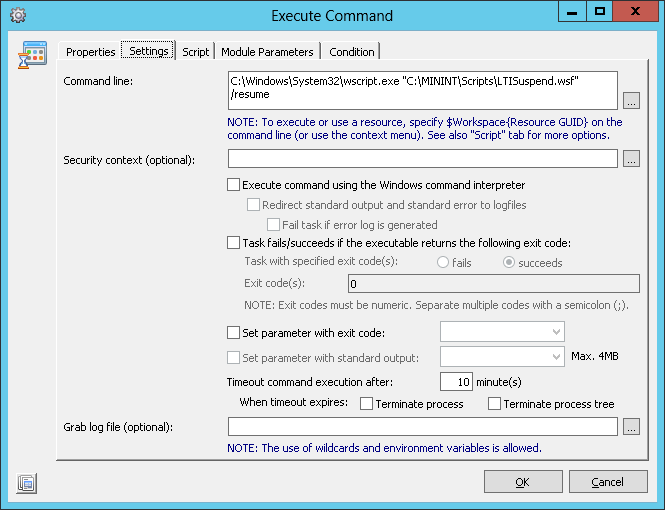 Today I’m going to show you how you can incorporate RES Automation Manager in MDT! 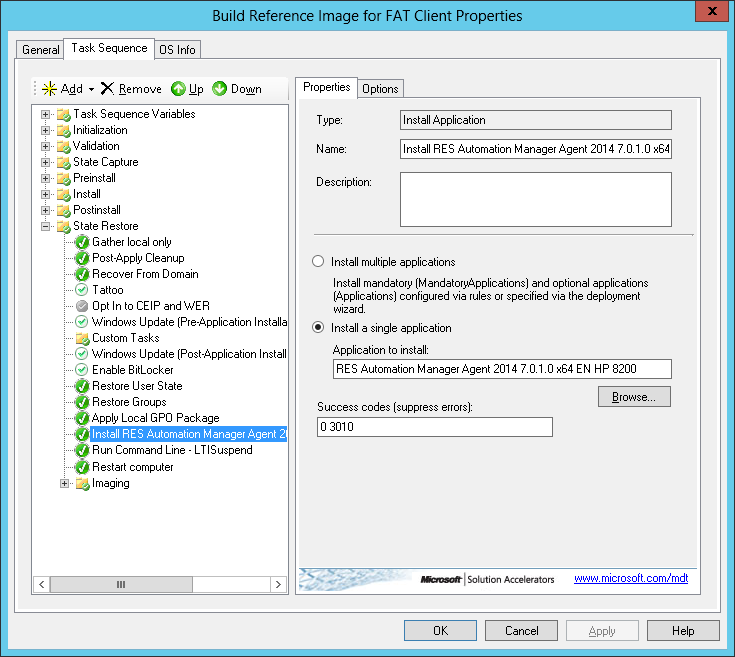 First of all we need to have the RES Automation Manager Agent, which needs to be imported in MDT as an application. Leaving the FinishAction property blank, will simply do nothing. The machine will be finished, MDT will clean-up it’s act, and RES Automation Manager will kick in, and depending on if you have created a project that always should be invoked on this particular deployment, RES Automation Manager will begin executing this project. The second option FinishAction=LOGOFF, will logoff the machine, making it unavailable for people to access the computer will it is being configured by RES Automation Manager. Today I encountered a different scenario which put’s things in a whole other perspective. 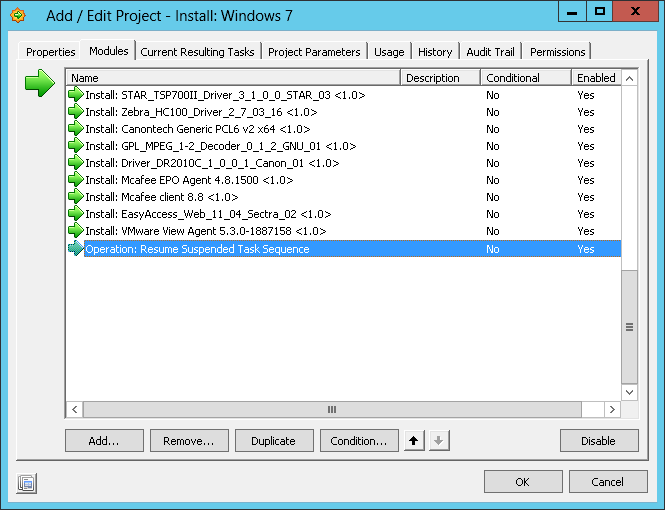 For this particular client who is building an Enterprise VDI image, the machine will be deployed with MDT, and when MDT is finished, RES Automation Manager will finalize the installation with middleware components and other configuration’s, before it is being converted to a VMware Snapshot which is at the basis of this VDI solution. 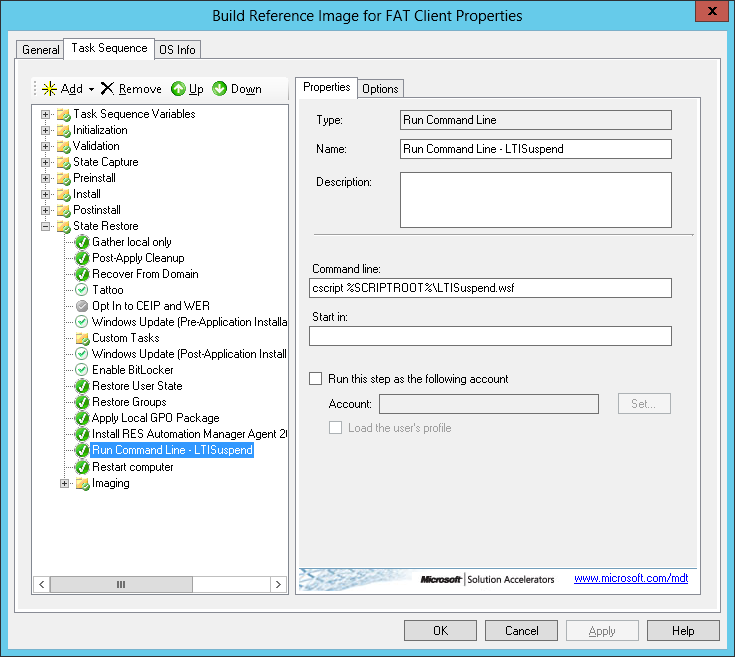 Now I received a question today, to use this same RES Automation Manager project, with some minor configuration changes to be used when creating a reference image with MDT on physical hardware to deploy to one and the same hardware model. Just to be clear, this goes against the concept of MDT. Building a reference image on physical hardware is basically a no-go. Due to driver-store pollution, driver conflicts etc. this is something you want to avoid at all costs. Also using another tool to do the same as MDT is capable of, especially when creating a reference image, also might be a bit contradictory. However I do not question the client’s request. To achieve this, we again need the RES Automation Manager Agent incorporated as an application within MDT. Then in our task sequence we need to make use of the “LTISuspend.wsf” script, which temporarily pauses the MDT task sequence at any moment that the script is called. 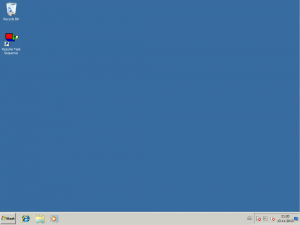 As you can see here, this happens right after the installation of RES Automation Manager. 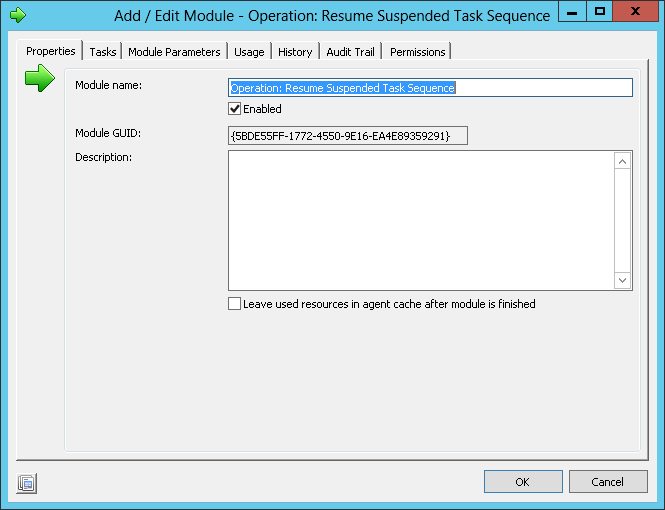 If you don’t pause your task sequence, or if RES Automation Manager isn’t the last action in your MDT Task Sequence, MDT will just continue executing other tasks when the RES Automation Manager Agent is installed! 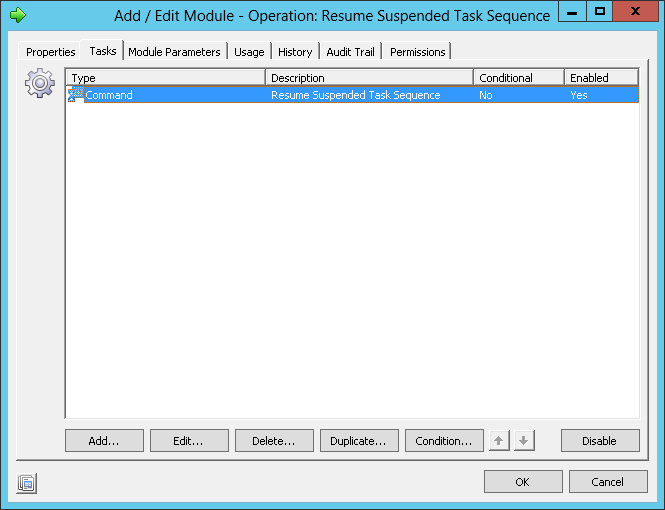 Reversed, RES Automation Manager will terminate the MDT Task Sequence process and you’ll be left with an incomplete deployment! Now, when RES Automation Manager is finished executing the project, the last thing RES Automation Manager will do, is execute the resume function of the “LTISuspend.wsf script”. In addition, you might want to delete the following REG KEY. Since it holds the GUID RES AM uses to authenticate against the database. 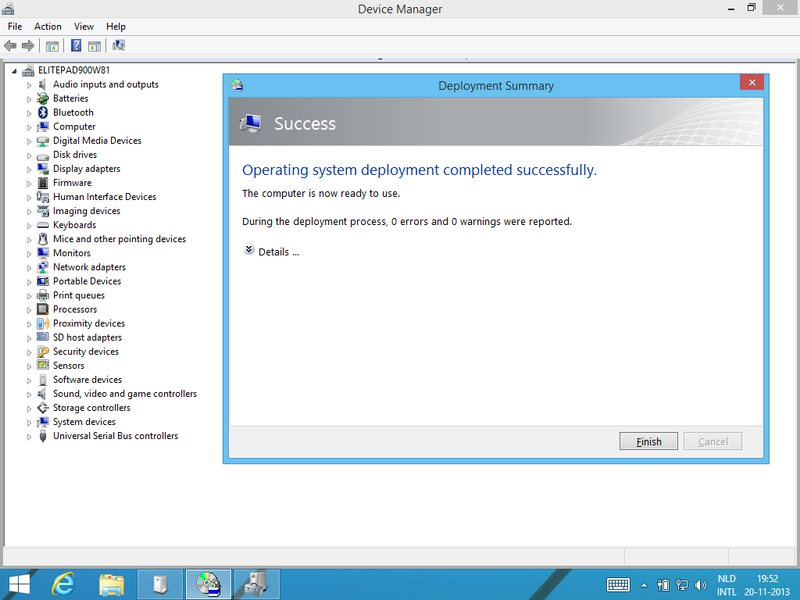 And sow I can now finally say: MDT and RES Automation Manager can live in (sweet) Harmony. And to underline this….MUSIC! Well… that’s a mouth full, but I couldn’t describe it better any other way 🙂 Because that’s what I’m doing right now! For a new project I’m working for a major health care facility which are going to use approx. 800 HP Elitepad 900 tablets, who will be running not the stock Windows 8, but the recently released Windows 8.1. To get things going I first installed a MDT 2013 dedicated machine, with the newly released Windows ADK 8.1 which brings us support for Windows 8.1 and Server 2012R2. Then I recovered the HP Elitepad 900 which was already used for some testing, back to factory settings and started the whole operation. For the following weeks, I will try to keep track of the most important things I encounter and share my experiences with you all. 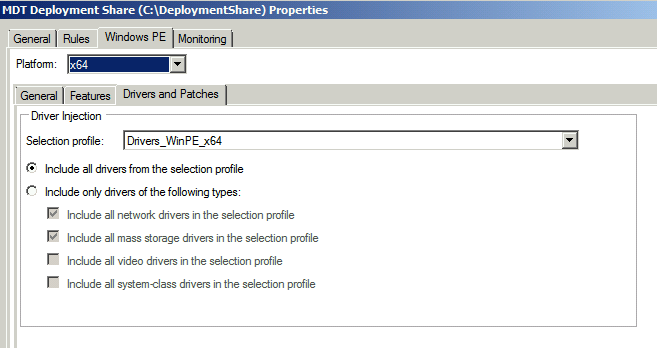 The first thing I had to do is create a driver folder structure in MDT which makes sense (at least for me it does). As you can see I created several additional driver folders parenting in the WinPE folder, this is all for driver manageability. 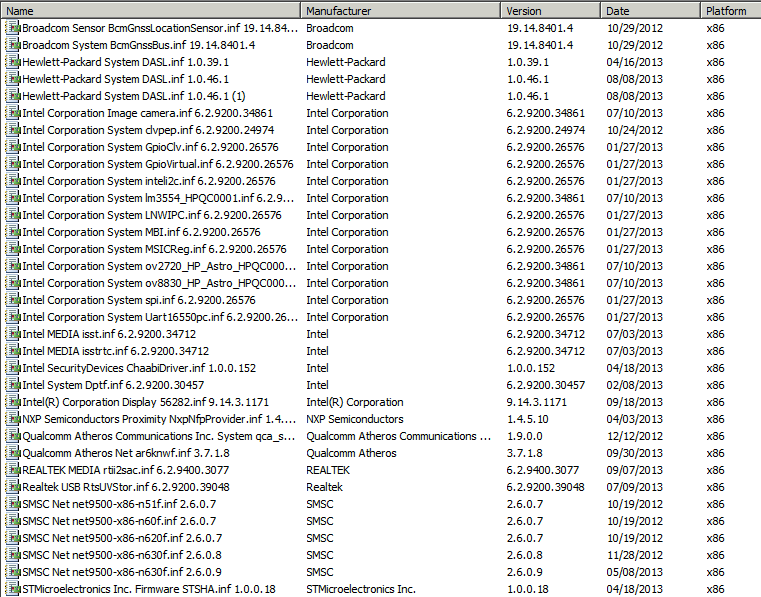 HP offers perfect support when it comes to driver packs for the various WinPE environments, so I have downloaded all available packs and imported them into MDT. 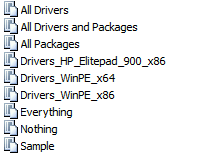 Keep in mind you need to extract the SP64292 file AND the SP63851, when all drivers are extracted, together with all other HP ElitePad 900 drivers, target the “Import Drivers” step to the parenting folder which possesses all drivers. 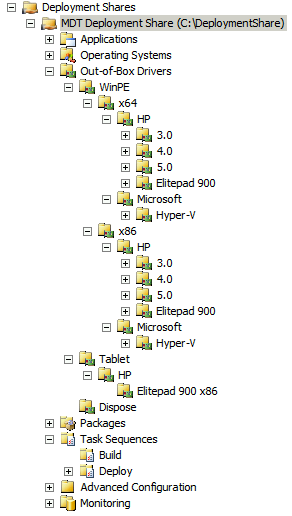 Because the HP ElitePad 900 also has touchpad (which actually works in WinPE IF you embed this into the boot image) drivers and other specific drivers, I targeted these drivers specifically in a separate folder. With these folders, I have created selection profiles. 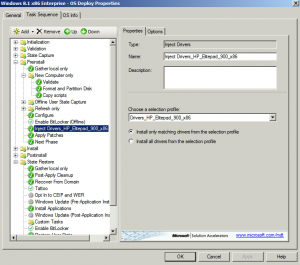 These selection profiles target individual (driver) folders and present only the content that is residing in that folder during a certain step in the task sequence. This way I have managed to create a WinPE x64 and x86 folder, and I can target these folders individually when generating the boot images for x64 and x86 deployments. 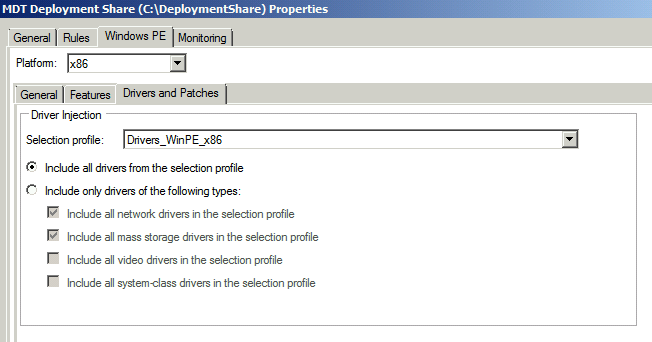 How this looks on the deployment share properties? Next we can have a look at targeting the drivers for the HP ElitePad 900 in a decent manner. 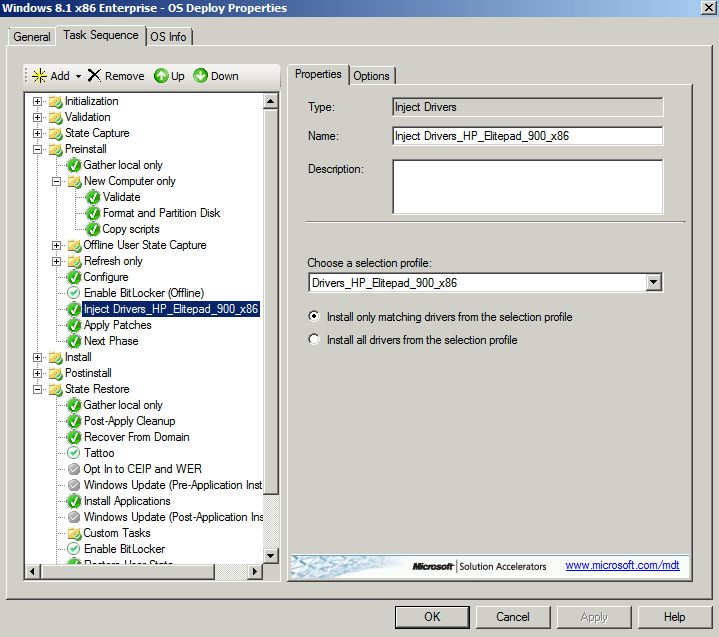 (Johan Arwidmark has described a new driver management approach for MDT 2013 Lite Touch, read it here). 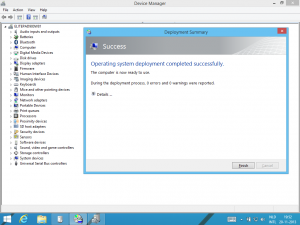 Figure 1.11: Device Manager OK! (no unknown devices left) and Deployment Finished successfully! 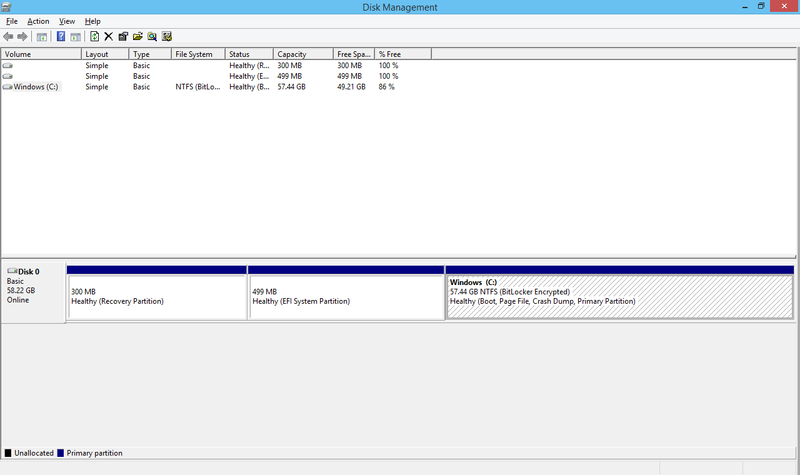 Also what we can see is that by selecting the GPT Disk type, during deployment the GPT partitions have been created automatically. This concludes my little tutorial of how to deploy Windows 8.1 to the HP ElitePad 900. And of course the test environment will be mitigated to a Windows Server 2012R2 with WDS and PXE Boot enabled to deploy these tablets via PXE, and we will see how that goes! When staging a HP ElitePad 900, make sure a USB keyboard is attached if you are performing an LTI deployment, yes touch works, but that doens’t mean you can type in WinPE!!! MDT 2012 will HideShell=YES and LTISuspend.wsf work together in one task sequence? 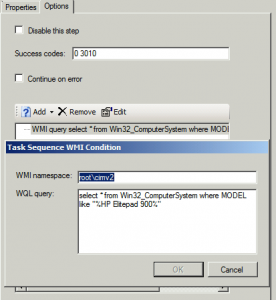 Published 13 November 2013 / by Rens Hollanders / 6 Comments on MDT 2012 will HideShell=YES and LTISuspend.wsf work together in one task sequence? Recently I have created a Build Task Sequence for a customer where it was needed to do some checks upfront, before the operating system, running on a virtual machine would be captured to a WIM file. 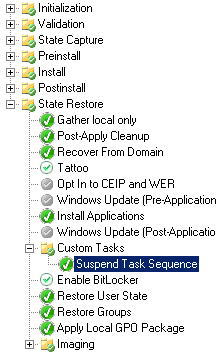 As some of you might know, the LTISuspend.wsf script, residing in the SCRIPTROOT of MDT (DeploymentShare\Scripts), can be called after the ‘State Restore’ step in the task sequence. 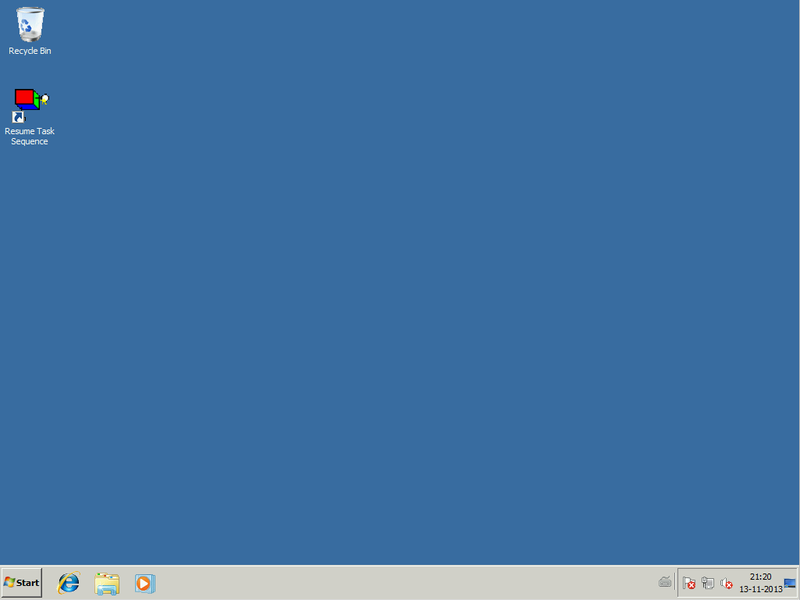 this will postpone the task sequence and create a shortcut on the desktop called ‘Resume Task Sequence’. 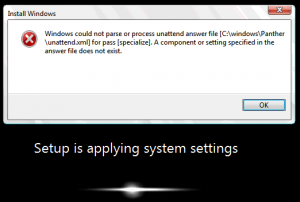 However when using the following property in your customsettings.ini: “HideShell=YES”, your desktop shell will not be fully loaded, thus it would be possible that no desktop, taskbar and other icons where presented during the LTISuspend.wsf. So use it with confidence! 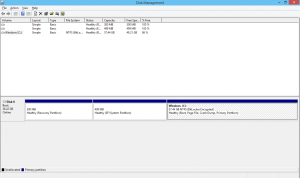 Recently I have done an MDT implementation for a customer regarding a deployment which featured an database of approx. 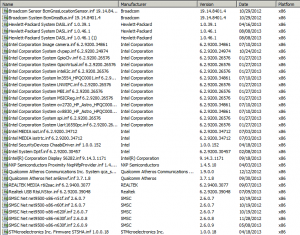 250 clients, each with known mac-addresses and host-names available to make use of. The customer requested that based on mac-address the host-name would be provided, and based on the host-name, Regional and Locale settings could be set during LTI deployment. 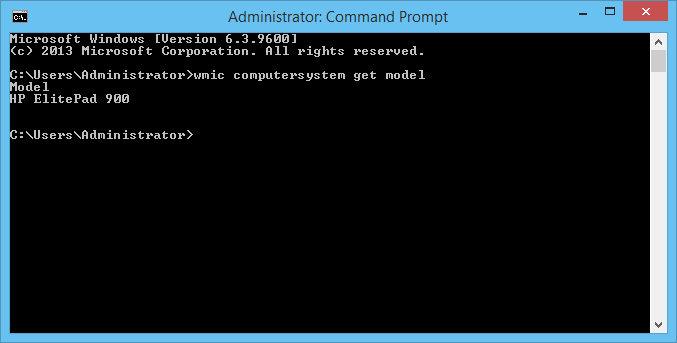 After a little bit of consult on technet and talked to deployment artist ‘Johan Arwidmark’, I’ve incorporated a custom ‘user exit’ script that does just the trick! sCountries = "DE ES FR EN NL"
Make sure you add the following properties to your customsettings.ini: “ByCountry“, “CountryAbbr” (which stands for Country Abbreviation) and define the custom properties: “CountryAbbr“, “CountryOU” as your custom declared properties. This way the script knows what to process. InputLocale: specifies the input language and keyboard layout for a Windows installation. KeyboardLocale: specifies the input language and keyboard layout for a Windows installation. UserLocale: specifies the per-user settings used for formatting dates, times, currency, and numbers in a Windows installation. 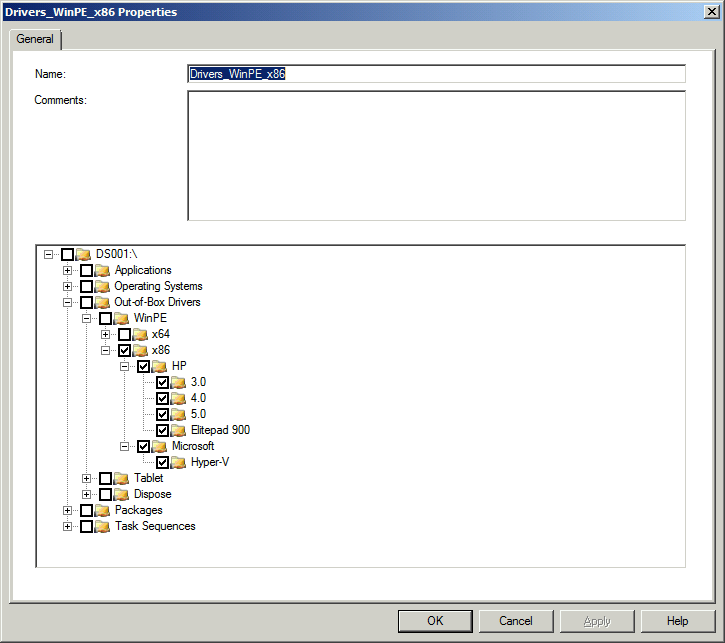 This way, the default values will be overwritten with the values that matches the hostname’s first two characters and the values will be placed in your unattend.xml, which is located in the “C:\Windows\Panther”, during the inital setup of the operating system, just after the image has been applied. This indicates that an incorrect value has been written into the unattend.xml, likeley in the <specialize> pass, you can look this up by opening the unattend.xml with notepad during your deployment. You can just use any country abbreviation that is out there, accompanied by the default settings for this country, or off-course your own values, and also, extend the list of values with other country related settings you wish to apply.